Farrar, Straus and Giroux (BYR), 9780374382407, 40pp. 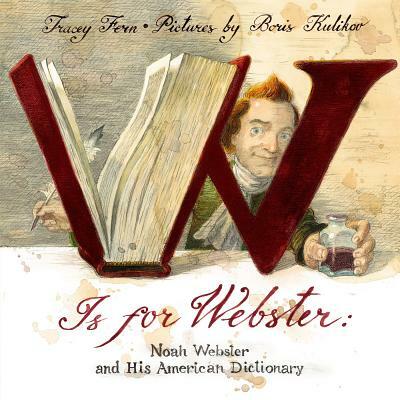 From an early age, Noah Webster was an odd fellow who liked to talk big and loved learning. He thought America needed its own national language and knew he was just the man to create it. He started with a speller, including everyday words like "scab," "grub," and "mop," and moved on to create a small dictionary. He rode around on a horse, selling his books by hand. Then Noah decided to compile a complete and comprehensive dictionary of American English. He thought the book would take him five years to finish. It took twenty, but his dictionary today is the second-most printed book in the English language. Boris Kulikov is the critically acclaimed illustrator of many children's books. His work includes Papa's Mechanical Fish by Candace Fleming; W is for Webster by Tracey Fern; and the Max's Math series, written by Kate Banks.He lives in Brooklyn, New York.